McGregor has a net worth estimated at $35 million, and that’s NOT including whatever he earned in his fight against Mayweather. According to sources, McGregor earned $12 million for defeating Jose Aldo in December of 2015 (in 13 seconds), and as much as $25 million combined for his two brawls with Nate Diaz. And according to sources, his totals earnings for the Mayweather fight will be close to $100 million. With that kind of cash in his bank account, it wouldn’t surprise us if McGregor called it quits sooner than later. After all, how much money does a man really need…? If you’ve never bought a pair of shoes made of python or alligator skin, then you’ve probably never run into this problem at the airport. Apparently McGregor’s fashion habits cause a lot of headaches when he’s traveling. He has several pairs of shoes that need their own traveling passport, because he travels to states that outlaw the purchase of certain animal skin products. 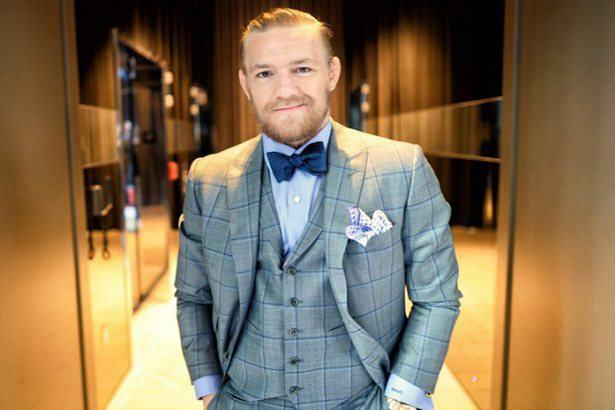 According to his girlfriend Devlin, if McGregor forgets to pack the passports for his fancy shoes, airport security seizes them… Rich people problems! In April of 2011, McGregor destroyed opponent Paddy Doherty with a devastating left hook just 3.5 seconds into the fight! According to complex.com, McGregor’s lightning fast knockout earned him the second-fastest KO in MMA history. His brutal TKO of Jose Aldo in 2015 didn’t take much longer. Before his last UFC fight, McGregor moved his entire entourage from Ireland to a mega mansion in Las Vegas. As a token of appreciation for their support over the years, McGregor rewarded his training team with an absurd seven-bedroom, 12,00-square-foot mansion just off the Las Vegas strip. Like McGregor, this mansion had some serious style — an olympic sized pool, a custom hot tub, a gym (of course), and floor to ceiling windows. McGregor admits to being in a lot of fights as a kid. But there is one story in particular that stands out above the rest. When he was 12-years-old, an argument between McGregor and a kid from his neighborhood quickly turned into a street fight. McGregor had been watching tape of his idol, boxing legend Muhammad Ali, and thought this was the perfect time to show off his best Ali impression. He began shuffling his feet and shouted “Muhammad Ali!” as he threw a wild punch… Even though his punch missed — and he was jumped by the boy and five of his friends — word of his Ali impression spread throughout the neighborhood. McGregor proudly tells this story whenever he can. In 2008, McGregor’s fighting career almost came to an end before it even got started. After his first few fights, McGregor disappeared from the gym, and started spending all of his time and money partying. At the request of McGregor’s mother, his trainer, John Kavanagh, came to the house to talk some sense into the talented (but immature) young fighter. Kavanagh promised McGregor he would waive all training fees if he came back to the gym. Kavanagh realized McGregor’s potential even before McGregor himself knew what he was capable of. McGregor owes a lot of his success to his training team, but he always goes out of his way to mention the massive contributions made by his longtime girlfriend Dee Devlin. In a recent interview with VIP Magazine, McGregor had this to say about Devlin — “My girlfriend has been there since the start. She has helped me throughout my entire career. If it wasn’t for her, I probably wouldn’t be where I am today.” When she’s not screaming from the stands, Devlin is busy managing McGregor’s finances. She is officially a member of the team, and travels with him wherever he goes. Conor isn’t the only McGregor you should be scared of. His sister Erin is a competitive bodybuilder, and almost as ripped as he is! The two siblings were always extremely close, but Erin says she has an even stronger bond with her younger brother, now that she can relate to how hard he works as a fighter. In 2007, at the age of 18, McGregor made his MMA debut in an amateur fight against Ciaran Campbell in Dublin. McGregor finished off his helpless opponent via TKO in the first round. As you can see in the video above, it wasn’t much of a fight… Following the fight, McGregor turned pro and was signed by the Irish Cage of Truth. In 2008, he began training with world renowned trainer John Kavanagh at the Straight Blast Gym in Dublin.